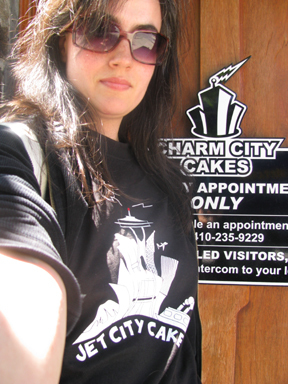 Yes, that is a Jet City Cakes T Shirt outside Charm City Cakes in Baltimore. I have been meaning to get this posted for awhile but, well, uh…I didn’t. Many thanks to Holly for taking the time to be so fashionable in Baltimore. Jen posted to Cake Wrecks so now I can reveal what happened at the Cake Wrecks World Tour. Actually, the post is awesome so check it out yourself by clicking HERE. 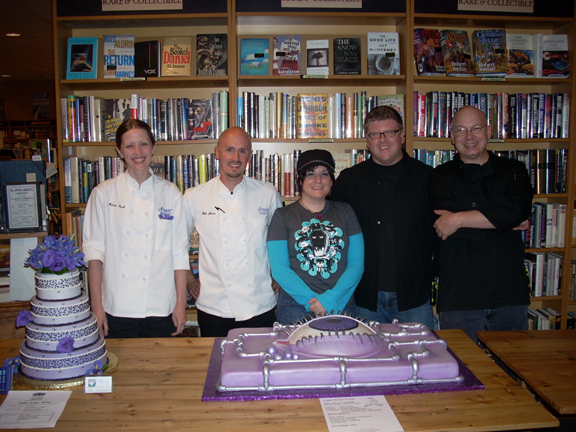 But here is a picture of Heather, Matt, Jen, John and me at the event with our two cakes. This Saturday we did a cake for Jen Yates of the fabu blog Cake Wrecks . She and her hubby John did a book signing at Third Place Books in Kenmore and we busted our cakey freedom moves along with Starry Nights Catering and Cakes from Kirkland. I am not going to post what we did quite yet, I am going to let Jen post first, but it was an outrageous team effort from both bakeries. However, we are featured on the Cake Wrecks Sunday Sweets today along with Starry Nights and the others that have contributed to the Cake Wrecks “World” Tour add funny quotes around world. Final warning: JCC at Waterways. 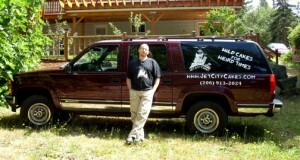 This Thursday evening Jet City Cakes is participating in Waterways Cruises 16th Annual Spring Showcase. We invite everyone to come down and say hi and to check out not only our display but other vendors for your upcoming events. RSVP by clicking here or going to www.waterwayscruises.com . Yes, I know I am really bad about updating the blog. I have come to accept that. Thanks for asking. We have new cakes posted! We now have a guitar and drum cake on the site so all we need is bass, keys and a glammed out singer cake and we are ready to tour! This is shaping up to be an even busier year for us. Thanks for your support! In other news, Jet City Cakes has brought on our first official Intern/Minion! We welcome Kitty to the insanity that is cake. She is a very talented artist and foodie and has helped us turn out some really fantastic stuff including the recent Champagne Cake and Mt. Rainier retirement party Cake. Here you can see her utilizing her fantastic powers of concentration in the midst of our high pressure professional kitchen. Kitty has been a terrific addition to Jet City Cakes and we highly recommend that any high-end confection and dessert establishments that want to lure her away from us by maybe actually paying her to feel free to stick your tongues on the nearest flagpole. You’ll be glad you did. We have to go in now, the bell rang. We have been nominated on the King 5 Best of Western Washington blog! Check us out HERE. 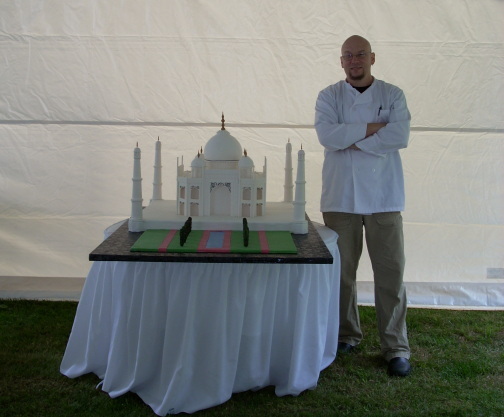 Thanks for all your support and great cake events over the past year. Ok, I know that long intro videos on websites can be a major pain. Folks just want to get to the content, cool pictures, snarky comments et-cetera. But the thing is that we made a pretty spiffy video with a site called Animoto and want to show it off. Maybe we will put it on the Gallery page, but here is the latest remix.